1. Heat oven to 177°C (163°C for dark or nonstick pans). Grease 2 (8.6cm) round cake pans with shortening; line pans with cooking parchment paper. Make cake mix as directed on box, using water, oil and eggs. Pour batter into pans. 2. Bake 25 to 29 minutes or until toothpick inserted in center comes out clean. Cool 10 minutes; remove from pans to cooling racks. Cool completely. 3. In small bowl, mix coffee syrup ingredients. Set aside to cool. 4. Meanwhile, in large bowl, beat mascarpone cheese, 1 1/2 cups powdered sugar, 2 tablespoons brandy and the vanilla with electric mixer on medium speed until smooth. In small bowl, beat whipping cream with electric mixer on high speed until stiff peaks form. Gently fold whipped cream into mascarpone mixture until combined. 5. To assemble, cut each cake horizontally to make 2 layers. Place 1 cake layer on plate; moisten generously with coffee syrup, then spread with about 1 cup of the filling. Repeat with remaining 3 cake layers. Spread remaining filling over top and side of cake. 6. Sprinkle cocoa over cake. 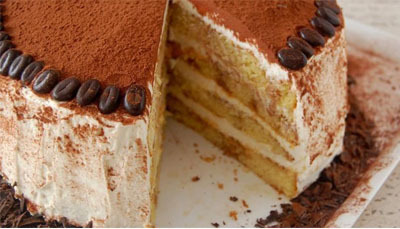 Arrange coffee beans around top edge of cake. Sprinkle chopped chocolate around bottom edge of cake. Refrigerate at least 3 hours before serving.